OKOTOKS, Alta. - Federal Liberal Leader Justin Trudeau thinks there are lessons to be learned from the legalization of marijuana in some U.S. states. Sales of marijuana to adults over 21 began Jan. 1 in Colorado as the state legalized pot for recreational purposes. Washington's stores are expected to open in late spring. Last summer, Trudeau admitted to smoking pot after becoming an MP and has maintained that legalization in Canada is a good idea. He said Canada would benefit from keeping a close eye on the experiences in Colorado and Washington state. He said there are all sorts of questions to be asked about how it actually works in practice. "It's just how they balance the need to protect people and control a substance and respect people's freedoms," Trudeau told reporters after a 90 minute meet-and-greet with 200 supporters in Okotoks, south of Calgary. "I'm very interested in drawing on best practices and not repeating mistakes that other people might make." 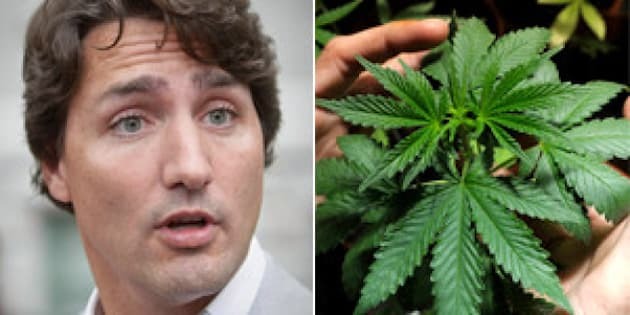 What matters now, Trudeau said, is ending a marijuana prohibition policy that he says costs law enforcement $500 million a year and has left 475,000 people with criminal records since the Conservatives took office in 2006. "The fact of the matter is our current approach on marijuana — the prohibition that Stephen Harper continues to defend — is failing in two primary ways. The first one is it is not protecting our kids from the negative impacts of marijuana on the developing brain," said Trudeau. "Secondly, we are funnelling millions upon millions of dollars each year into organized crime and criminal gangs. We do not need to be funding those organizations." Trudeau said he has smoked pot five or six times in his life and never really liked it much. The local RCMP were called to the community centre over reports that two men were smoking pot outside the venue where Trudeau was speaking but the individuals produced licences proving it was medicinal and no arrests were made. Trudeau kept to familiar themes during a speech criticizing the Harper government for failing to convince the U.S. government to approve the Keystone XL pipeline. He was asked by a supporter what he thought about Harper's visit to Israel. Trudeau said he supports the visit but Harper shouldn't have done it in such a "partisan" way.